I feel like I finally perfected juicy, meaty and flavorful meat sauce. Every cook should have meat sauce recipe in their back pocket. Prep time is 3 minutes, kids love it and it’s much easier than bolognese sauce or meatballs! 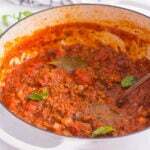 And homemade meat sauce is such easy but fancy Italian dish you could entertain with. Serve it over quality al dente pasta garnished with Parmesan cheese and a bottle of good red wine. And your guests will be knocking on your door next weekend. All right. So, here is how I do it. 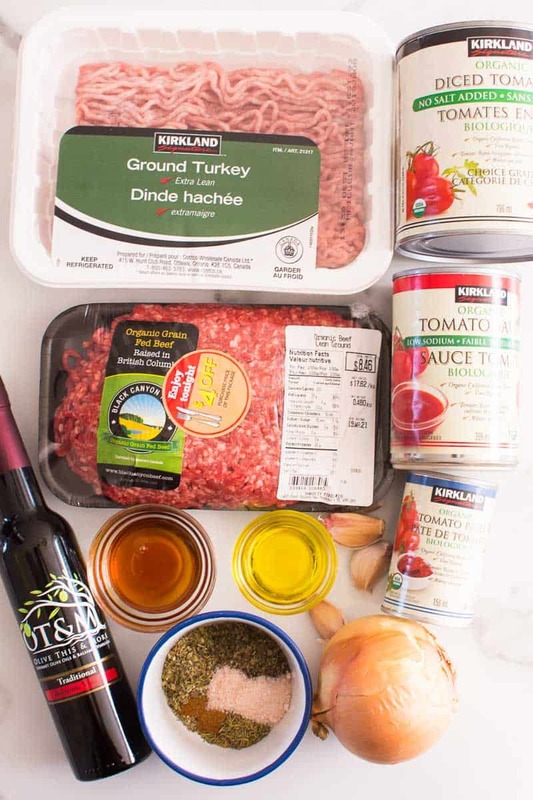 When it comes to meat for tomato meat sauce, I like a combination of grass-fed or organic ground beef and lean tender ground turkey. I feel 1.5 lbs is perfect amount, where as 1 lb of meat is not enough. I add traditional dried herbs and bay leaves. 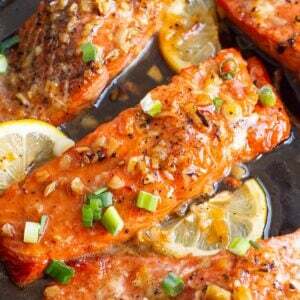 And I personally love addition of sweet balsamic vinegar and rich olive oil. And one secret punch of flavor I got from my neighbour is a pinch of cinnamon. 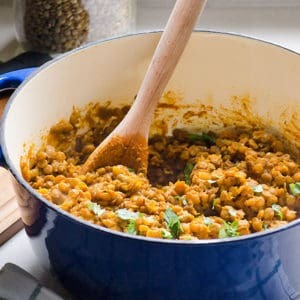 You will not believe that extra touch of sweetness and warmth it adds to this quick meat sauce. Just trust me! So I perfected this Italian meat sauce recipe using a combination of canned diced tomatoes, tomato sauce and tomato paste. Each of them layers different texture on top of another texture making the best spaghetti meat sauce! 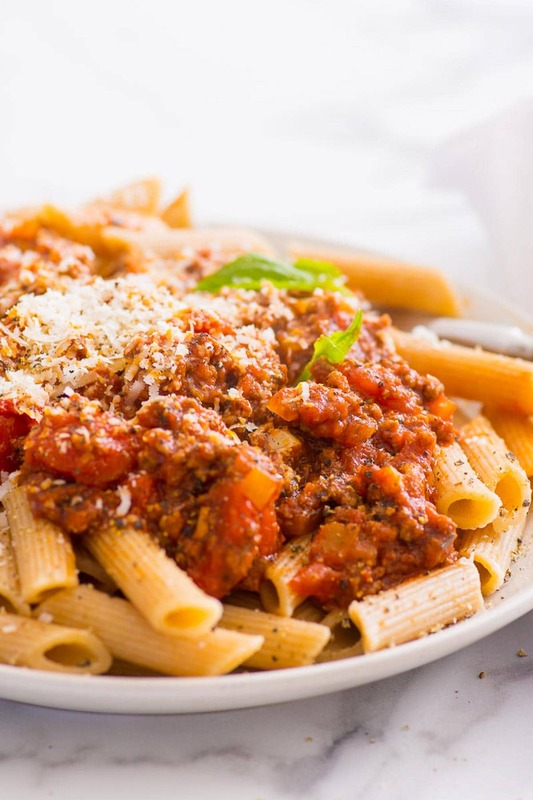 This meat sauce is thick, chunky and flavorful! It’s perfect! 1. Cook ground meat in a hot cast iron pot breaking and stirring with spatula constantly. Takes about 5 minutes. 2. Add onion, garlic and dried seasonings. Please note onion doesn’t need to brown but herbs benefit from high heat to release maximum flavors. 3. 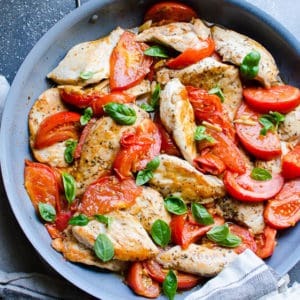 Add canned tomatoes and liquid seasonings. Stir, cover and cook on low-medium heat for about 30 minutes. Covering the pot prevents red splatters all over the stove. 4. To thicken meat sauce: Open the lid a little bit to the side and cook for 15 minutes. 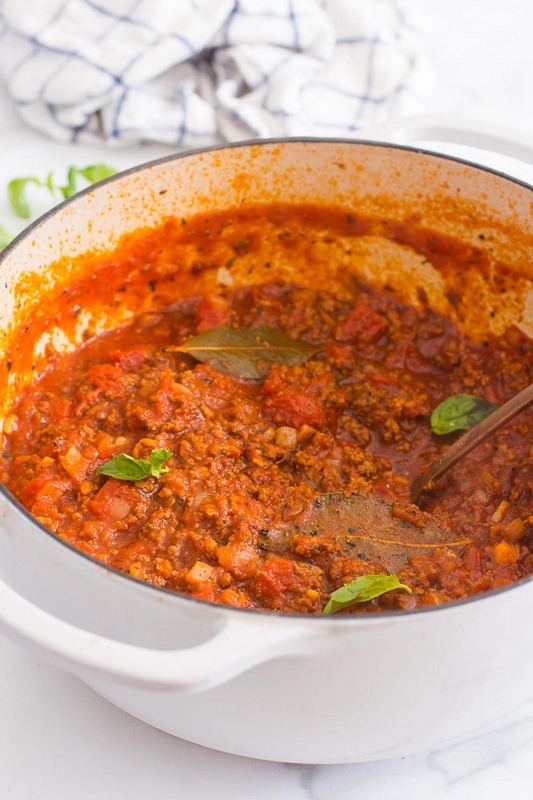 Moisture will evaporate making perfect hearty and thick meat sauce. When it comes to pasta for meat sauce, the default is spaghetti. My personal preference is short pasta with holes or grooves to scoop up the sauce. Like penne, rigatoni, corkscrew or even macaroni. I always try to buy whole grain and preferably organic pasta. But it’s real life and not every store carries healthy pasta. I do what I can. We have been eating whole grain pasta for 15 years now and my kids don’t know the difference. It contains the bran and more fibre than traditional white pasta. Organic is the best to avoid consuming carcinogenic glyphosate. Tip: Cook pasta in salted water to prevent sticking. 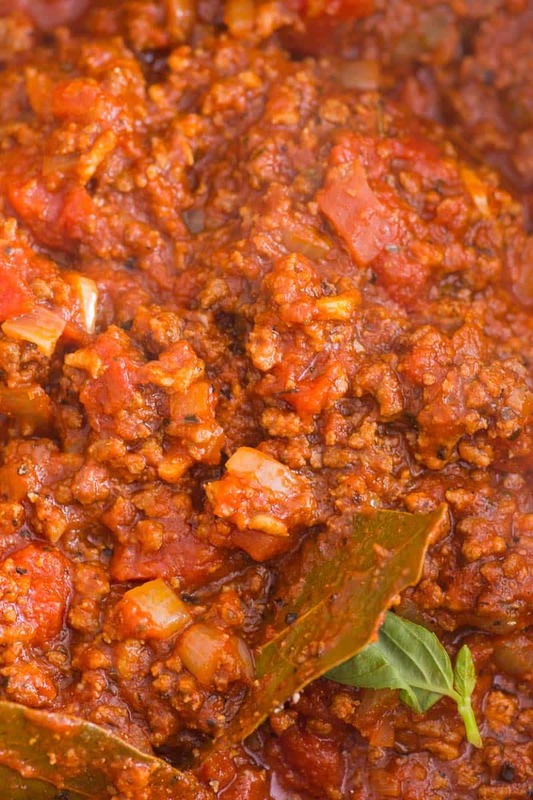 I promise you can make the best homemade meat sauce yourself! 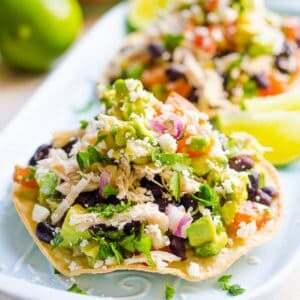 I hope you enjoy this recipe and we are working on a video for it next week. What to do with leftover spaghetti meat sauce? Freeze it. I like to freeze food in glass containers. 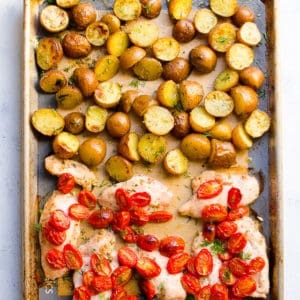 I know many freeze flat in plastic Ziploc bags but unless it’s healthy freezer meals, I avoid using plastic for health reasons. Definitely “yes”. 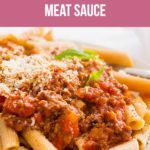 Meat sauce is perfect for freezing because it doesn’t contain cooked starches or watery vegetables that become soggy once thawed. So make sure you don’t mix it with cooked spaghetti. How long can you freeze meat sauce? For up to 3 months in an airtight container. I prefer glass for health reasons and environment as much as I can. But real life strikes, I get it. 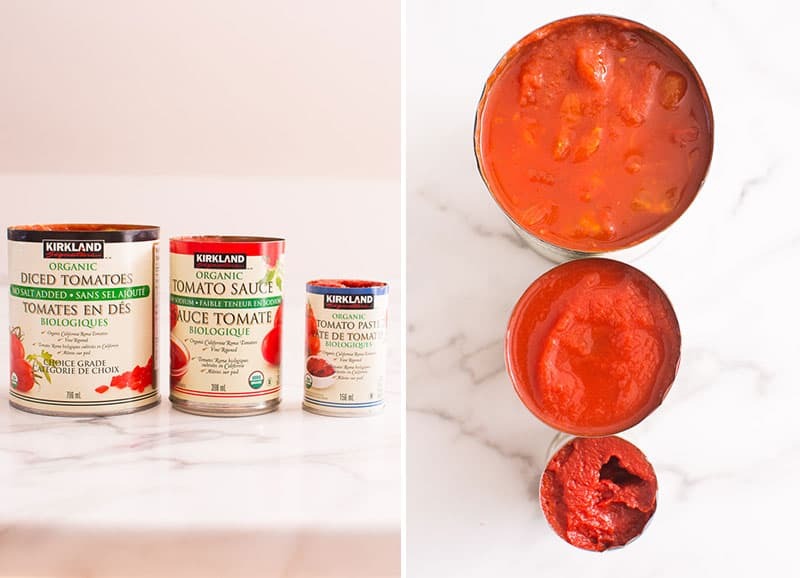 Spaghetti with tomato sauce – 10 minute vegetarian dinner your kids will love! 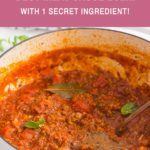 One secret ingredient make this easy and hearty meat sauce recipe extra sweet and warm! 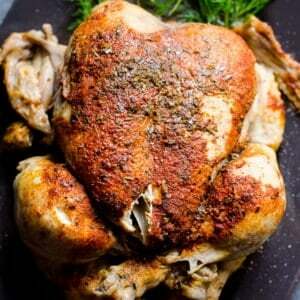 Preheat large dutch oven or heavy bottom pot on high heat and add ground beef and turkey. Cook breaking into small pieces and stirring with spatula constantly, for about 5 minutes. Add onion, garlic, oregano, basil, thyme, cinnamon, salt and pepper. Cook for about 2 minutes , stirring a few times. Please note onion doesn’t need to brown but herbs benefit from high heat to release maximum flavors. Add olive oil, balsamic vinegar, maple syrup, diced tomatoes, tomato sauce, tomato paste and bay leaves. Stir, cover and cook on low-medium heat for about 30 minutes. Covering the pot prevents red splatters all over the stove. Open the lid a little bit to the side and cook for another 15 minutes. Moisture will evaporate making perfect hearty and thick meat sauce. Stir and serve hot over whole grain spaghetti or any tubular pasta, garnished with freshly grated Parmesan cheese. 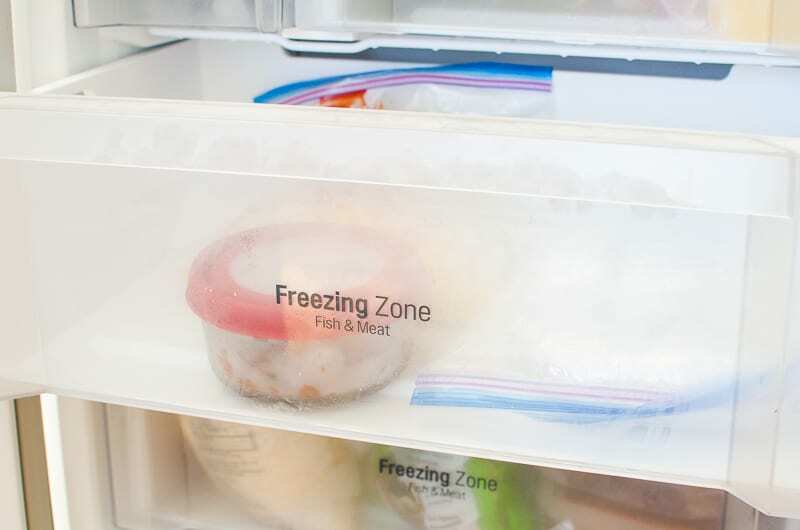 Freeze: Fully cook, cool completely and freeze in an airtight container for up to 3 months. Thaw overnight or on a stovetop covered on low. You can use all ground beef or all ground turkey if you wish.